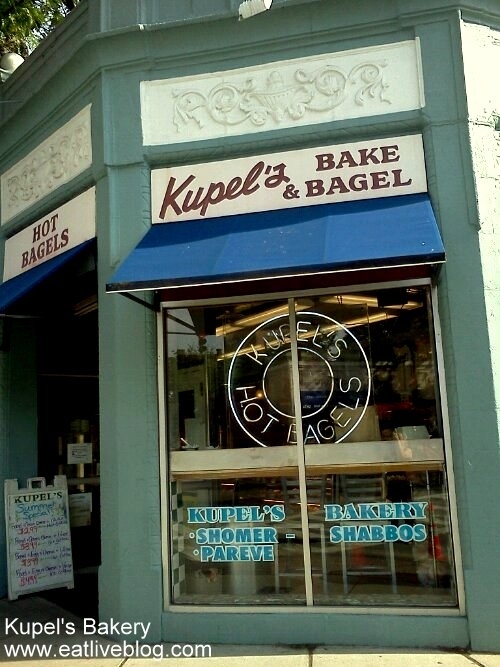 Kupel’s Bakery: Boston’s best bagel by bounds! My love affair with Kupel’s dates back to July 11, 2004. That’s right, I know the actual date of my first visit to Kupel’s. It was the 2nd weekend after our move to Boston from Florida. When I was growing up, my dad would always be the first up on Sunday mornings, and he would head to Clearwater Bagel to pick up bagels, cream cheese and all the sides. When we woke up, we had a fresh-baked bagel smorgasbord waiting for us! For my first non-holiday weekend in Boston, I wanted to start this tradition as well! I grabbed my handy Guide to Boston, which told me Kupel’s and none other, and started to trek out to Brookline. 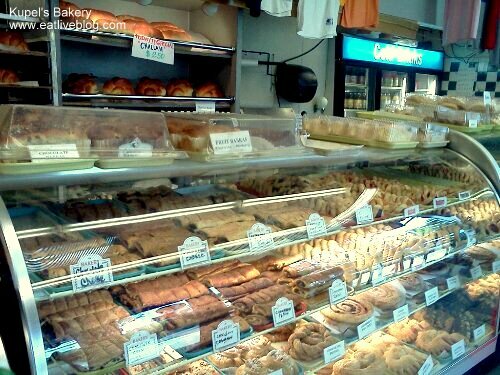 I walked in to the bakery, and knew I would not disappointed. Tens of busy workers were shuffling around in the bakery in the back. There were endless amounts of baked goods that I had, until this point, only indulged in at Friday Night Services. 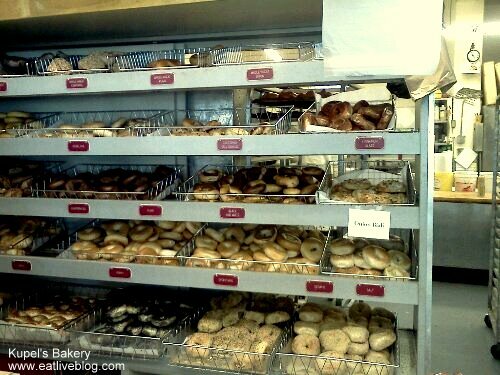 And the bagels…..they were all hot and looked just perfect, and there must have been 20 varieties to choose from! Not only that, but Kupel’s does the one thing no one else seems to get, they make ALL of their flavored cream cheeses in both regular and lite versions! Hallelujah! Just because I like light cream cheese, doesn’t mean I don’t want flavor people! Kupel’s bagels are smaller and dense, which is how I expect a good bagel to be! The flavor you choose is up to you, but I almost always go with the Whole Wheat Everything Bagel with a side of Lite Jalapeno or Light Veggie cream cheese. 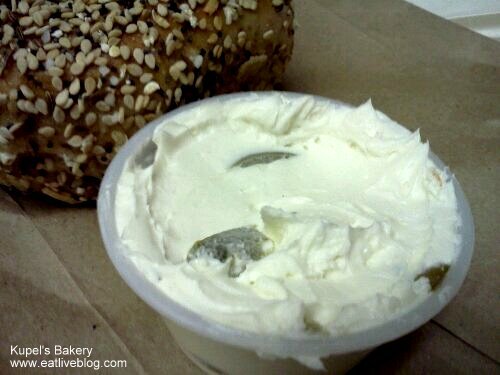 Kupel’s Light Jalapeno Cream Cheese – Look at those junks of peppers!! The flavored cream cheeses are obviously mixed in-house, with large chunks of the vegetable, herb or lox in every bite. If the bagels weren’t so darn good, I would say the cream cheese is the star of the show! 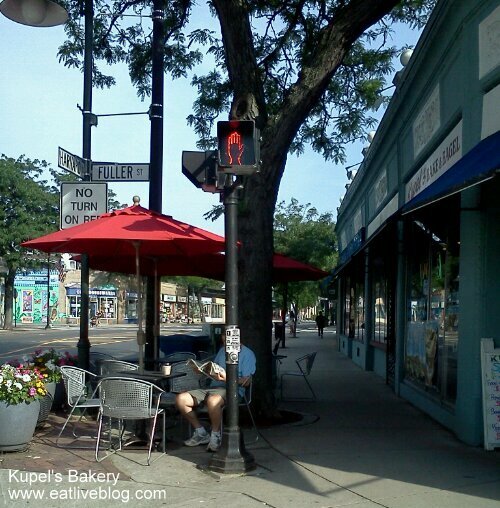 New in the last year or so to Kupel’s, outdoor seating! I could go on for days about my love for Kupel’s, but I would rather you just go try it for yourself and let me know what you think. Seriously, you live in the Boston area, you love bagels, why are you wasting your time anywhere else? 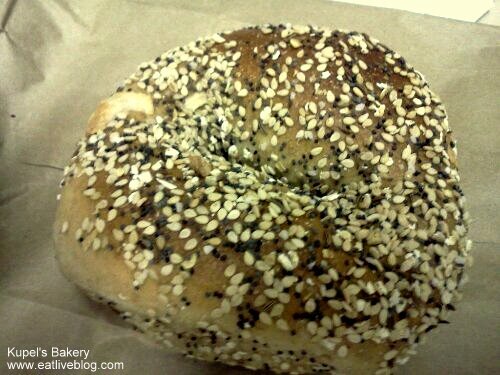 This entry was posted in Reviews and tagged bagel, bakery, best bagel, boston, brookline, catering, cream cheese, jewish bakery, kupels, review by reneeh. Bookmark the permalink. Brookline really does have the best bagels in Boston! I’ve only tried Kupels once or twice but clearly need to be making more visits. I definitely need to get over there. I usually wait until we are heading to visit Jeff’s parents, and then we pick up bagels at Life’s A Bagel in Canton. 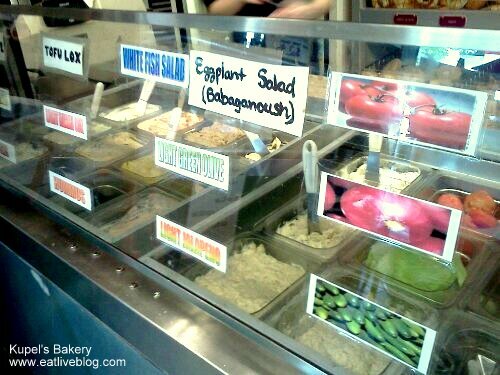 Love their bagels, but I’m betting I would love these as well! Oh yes, indeed! I can’t decide if it’s a blessing or a curse that I live so nearby. Between Kupel’s and Zaftig’s, I’m going to need bigger pants! Marlena you definitely picked a delicious place to live! That is for sure! The Regal Begal is another one of my favorites! Wow, I loved your blog and what a display of bagels!! Those pictures are awesome!Thanks for commenting on my guest post Cauliflower-lychee curry on Wan Maznah’s blog cooking-varieties. I love your blog. I love bagels! Although I am kind of a nj bagel girl. So are you heading the boston brunchers event on the cruise? i can’t wait! is there anything i have to do?